My pinterest project this week was a sign for Perry's bathroom. So far I have not done a lot with his bathroom...well because he really won't be using for quite a while and I had bigger things to decorate (like a nursery). I did buy him some new towels and decided to go with a general navy and green theme. The walls however are were totally bare. This is the first of several projects I have planned to help spruce up his bathroom walls. I found the quote on pinterest (it has been around forever...I had just forgotten about it) painted on a piece of wood. After doing some searching for a digital download of the quote on etsy with little success, I decided to improvise and make my own version of the sign. It is surprising what you can do with microsoft word, a few different fonts, and a bunch of text boxes. I am quite happy with how it came out. I literally made the sign in word, printed it on plain white paper and then framed it in this cute navy (even though it looks black in the picture) 8x10 frame I found at hobby lobby 50% off. 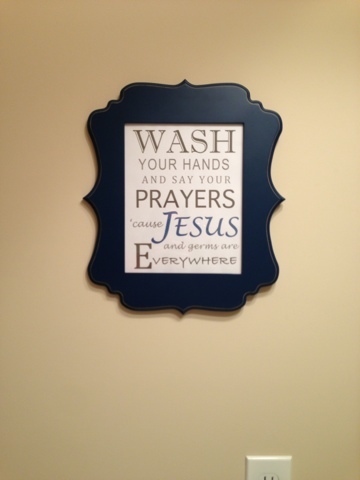 I finally got hubby to hang it in the bathroom tonight and I love it! Once I get the bathroom more put together I will post more pictures.